As HD video takes the baton from SD video, and gradually passes it on to 4K UHD, the video quality comes clearer and crisper, but meanwhile the video size is getting bigger and bigger. It's so much for normality that a video surpass 1GB. Thus, you do have to process in certain cases, such as for uploading to YouTube or the like, watching videos on portable devices or making it smaller for storage. While for large 4K UHD video files processing, users care more about the conversion speed and output quality, after all, no one could stand spending several hours to convert a single video. Given this, a video converter with hardware acceleration supported could make everything well. And here we're talking about CUDA GPU accelerated video converter. What's CUDA GPU Hardware Acceleration? 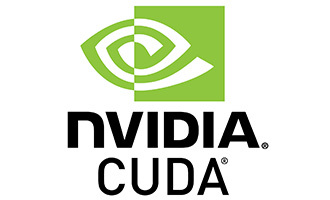 CUDA is a parallel computing architecture developed by NVIDIA for general computing on graphical processing units GPUs. With CUDA, users are able to dramatically speed up computing applications by harnessing the power of GPUs. Thanks to NVIDIA CUDA computing tech, the video conversion processing enters a new era. When running a free video converter with CUDA supported, the sequential part of the workload runs on the CPU, which is optimized for single-threaded performance - while the compute intensive portion of the fast CUDA video encoder runs on thousands of GPU cores in parallel. Free CUDA Video Converter developed by CUDA SOFT or Free CUDA Movie Converter can both process video at fast speed. But you cannot require too much for the freeware as it entails some loss of quality or a bigger file size. So there's nothing better than a tool that could help you process video fast with no quality loss, and output a smaller video files. MacX Video Converter Pro is precisely the one that takes full advantages of Nvidia CUDA technology to adequately accelerate video processing speed and output quality. Now, running on a Mac or PC with a Nvidia CUDA-enable Graphics card, you can get the utmost out of CUDA GPU acceleration through the CUDA video converter, achieving a 5X faster speed than other HD video converters in 2019. Meanwhile, thanks to the exclusive High-Quality Engine, no matter you're willing to transcode HD video to HEVC, H.264, MPEG4 and 370 more video & audio codecs, compress MP4 to smaller size up to 70% compression ratio, upscale SD videos to 720p/1080p/4K resolution, or trim the length of video, it outputs video without any quality loss. How to Convert Video Fast with CUDA GPU Acceleration? 1. You've downloaded the latest driver like GeForce GTX, Quadro CX, Quadro Plex, GeForce from Nvidia official site, and ensure your Graphics Card is supported. 2. Your computer is available for Intel/AMD/Nvidia CUDA hardware acceleration. Check it through Apple icon > About This Mac on MacOS, and right-click Computer > Properties to see the detailed hardware info. 3. 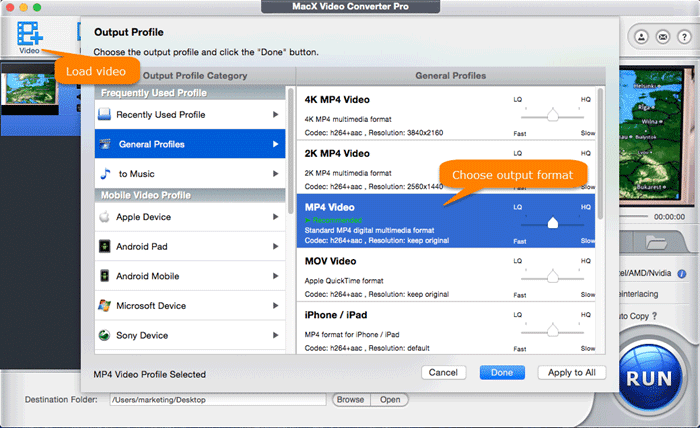 Your video converter supports hardware acceleration, the latest MacX Video Converter Pro V6.3.0 is the one. Free download the Nvidia CUDA based video encoder, install and launch it on your computer. Step 2: Import video files to be processed. Click on + Video to load the target video to the program. Take a 4K MP4 video as an example, click on it and tap Open to get it fully loaded. Or simply drag and drop this video to the program window. Step 3: Choose output profiles. After you video loaded, there pops a window with dozens of preset profiles to be selected, including general purpose formats, widely available models of Mac, iPhone iPad devices, and a variety of tablets and smartphones from Windows and Android. But since different people stroke different needs for video processing, here the most regularly chosen profiles are stated. 1. Apple Devices > to iPhone Video > iPhone X (h264) or any iPhone models > Done. If you're wondering to watch your 4K ultra HD videos on iPhone, iPad or mobile devices. The trick comes that choosing your target portable model from Mobile Video Profile column. 2. Mac General Video > MP4 Video (HEVC) > Done. When you find your 4K UHD videos are unreadable on your Mac computer, you can choose this profile indeed, which not only convert 4K UHD to HEVC to solve the format and codec issue, but also compress 4K video file size up to 50% with no quality loss. There are cases that your 4K UHD video format is fully compatible with Mac desktops, for example, the iPhone 8/8 Plus, or iPhone X recorded 4K video in 60 fps, but it still cannot be watched on your Macbook Pro/Air. Thus, you could click , then lower the iPhone 4K video frame rate from 60 fps to 30 fps to make it available on Macbook Pro/Air. 3. General Profiles > 2K/4K MP4 Video > Done. As you're trying to watch a low-resolution HD video on 4K TV, you'll get a blurry, even a mosaic visual effect since the pixels are forced to expand. Whereas if you've upscaled 720p to 4K or 1080p Full HD to 4K UHD in advance, the case will never happen. Step 4: Start processing video fast with CUDA GPU acceleration. Tap the RUN icon on the lower right corner, and the video is processing. Meanwhile, the Nvidia CUDA hardware acceleration is starting to work as well, helping you put the job off in minutes. You see, you don't have to do any settings to activate the hardware acceleration. If your computer is Intel/AMD/Nvidia enabled, the free CUDA video converter will automatically tick the box of Hardware Encoder, and you're able to achieve HD/4K video processing at fastest speed. With 2019's fastest CUDA GPU accelerated video encoder, video processing can be achieved in 5 times faster than usual, as well as much faster than its competitors like Handbrake, AVC, Movavi , Wondershare Video Converter. Unbelievable, right? I didn't believe it before the following speed comparison test. I tried to convert a 4K MP4 to 1080p with some top video converters 2019 powered by Nvidia CUDA technology. Firstly, I'm running my 27-inch iMac of 2013, with 3.2GHz Intel Core i5 processor, 16G 1600MHz memory, and NVIDIA GeForce GT755M 1GB graphics. MacX Video Converter Pro, powered by Nvidia CUDA/Intel/AMD hardware acceleration technology achieves No.1 fast speed and lossless quality for video processing, namely converting 4K UHD videos to H264, HEVC, MPEG-4, MP4, MOV, compressing 4K to 1080p/720p, editing videos etc.